Whole-body vibration (WBV) training is frequently applied in sports and rehabilitation with the aim of inducing beneficial functional and structural adaptations. In the past decades, blood flow restriction (BFR) training has received increasing attention by enhancing the effectiveness of several low-load exercise regimens. 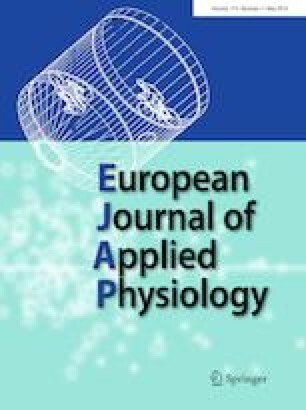 The objective of this study was to evaluate the additional effect of BFR on myoelectric activity and metabolic accumulation during WBV training. Fifteen active men performed three sessions in a counterbalanced order on three different days: whole-body vibration exercise (WBV), whole-body vibration exercise with blood flow restriction (WBV + BFR), and a control session (CON) with neither WBV nor BFR. Electromyographic (EMG) activity was measured in six lower limb muscles throughout each exercise session; lactate and reactive oxygen species (ROS) concentrations were determined prior to, immediately after and 15 min after the exercise sessions. EMG amplitudes increased from CON (29 ± 13% MVC) to WBV (45 ± 20% MVC) to WBV + BFR (71 ± 37% MVC) conditions (p < 0.05). Likewise, lactate concentrations increased in a similar manner, demonstrating significantly higher increases in the WBV + BFR session compared to WBV and CON. Furthermore, significant correlations between lactate concentration and EMG amplitude were detected. ROS concentration did not change significantly between the conditions. The findings of the present study emphasize that the addition of BFR increases the acute effects beyond WBV treatment alone which becomes manifested in both neuromuscular and metabolic adaptations. Further research is needed to identify potential long-term effects of the combination of these two training regimens. Communicated by Michalis G. Nikolaidis. The authors would like to thank all subjects who voluntarily participated in this study. CC, RR, SS, AG and DK conceived and designed the study; CC, RR and SS performed the experiments; CC, RR, SS, AG and DK analyzed and interpreted data; CC, RR, SS, AG and DK edited the manuscript. All authors approved final version of the manuscript.